We must eliminate all GHG emissions from the built environment by 2050 to meet Paris Climate Agreement targets. Buildings generate nearly 40% of annual global GHG emissions. Approximately two-thirds of the building area that exists today will still exist in 2050. Currently, building renovations affect only 0.5-1% of the building stock annually. A significant increase in the rate of existing building energy efficiency renovations and the generation and procurement of renewable energy is required to meet emissions reduction targets set by the Paris Agreement. Global building stock will double in area by 2060. 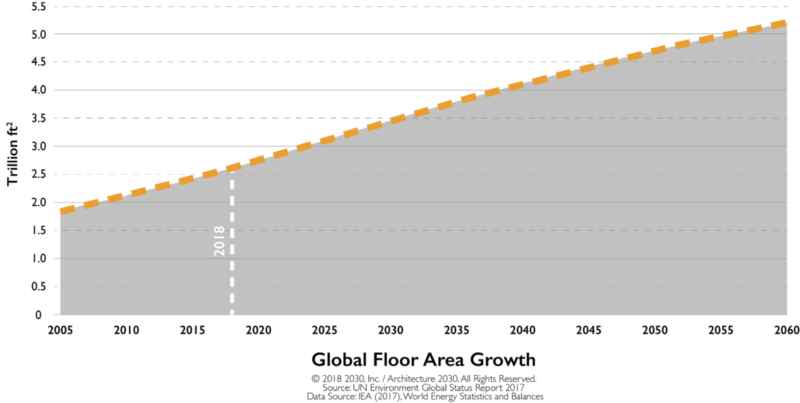 To accommodate this tremendous growth, we expect to add 2.48 trillion square feet (230 billion m2) of new floor area to the global building stock, doubling it by 2060. This is the equivalent of adding an entire New York City every month for 40 years. This new building stock must be designed to meet zero-net-carbon standards. 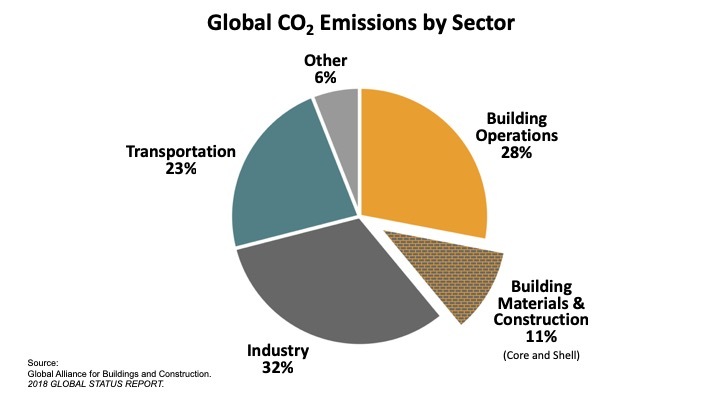 Embodied carbon is 1/4 of annual building sector emissions, and growing. 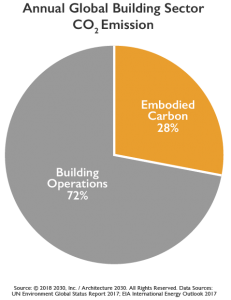 Globally, embodied carbon is responsible for 11% of annual GHG emissions and 28% of building sector emissions. As operational energy efficiency increases, the impact of embodied carbon emissions in buildings will become increasingly significant. We cannot meet climate goals without also eliminating embodied carbon emissions by 2050.